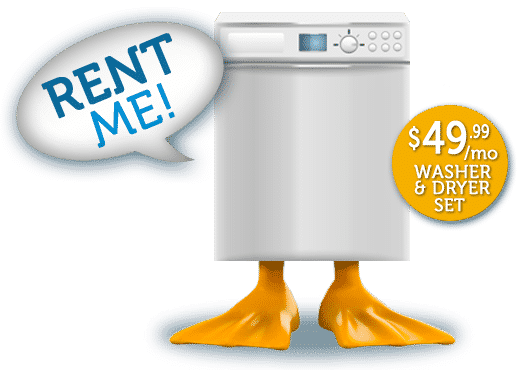 Looking To Rent A Washer Or Dryer In San Antonio? Please see our pricing page to view free delivery zones. If you have credit woes, worry no longer!! You CAN have the appliance you need for yourself and your family. To receive technical service at no cost, just schedule an appointment with QUACK RENTALS while your appliance is covered by this benefit. OPEN 9AM to 7 PM MON-SAT. We are open extended hours to service your rental requests. At every installation we will clean out your dryer vent using our professional rotary cleaning system. This will ensure your clothes dry quickly and you save money on your electric bill! NO JOKE. Enjoy freedom with no contract, no long-term commitment. Cancel online at anytime. Automatic order placement. Save time. You never will feel frustrated by a busy phone signal or from being placed “on hold”. Quack Rentals offers its clients the ability to request technical service online. No hassle! As a client you can schedule a pickup from the convenience of your desktop anytime, day or night. We will never charge a pick up fee! You are our top priority. Our team takes service to the next level. If you are comparing appliance rental services check the reviews.